We started out with a game that was new to the group, …Aber Bitte Mit Sahne (which means “…But Please, With Cream”, although the game is also known as “Piece o’ Cake” in English). This is a quick little set collecting game we’ve not played before with very simple rules. 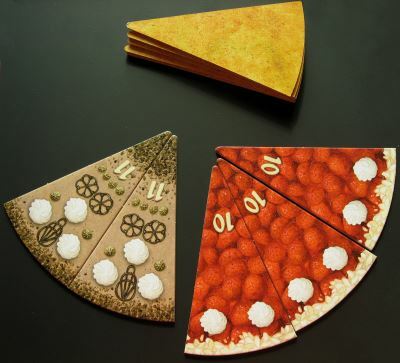 The game uses an “I divide, you choose” mechanism with points awarded to players with the most slices of the each different types of cake. The first player (the Baker) bakes a cake with the types determined at random. Each slice has a number of blobs of cream on it and a numeral demonstrating how many of that type there are in the game. The Baker then divides the cake up (usually so that there are sufficient pieces for everyone to have one), with each piece containing any number of slices of any type. Next, the player to the left of the Baker selects a piece of cake and chooses what to eat and what to keep. They can eat or keep as many slices they want. Any cake they choose to eat is turned face down and the total number of blobs of cream in the pile contributes that number of points to the the final score. Thus, each player takes a piece of cake and chooses what to eat and what to keep, finishing with the Baker. Then the next player takes a turn as the Baker and so on. The game continues for five rounds. 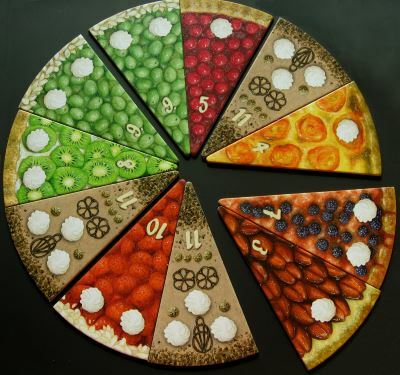 At the end of the game, each type of cake is assessed and the player who has collected the most slices of a variety receives points. 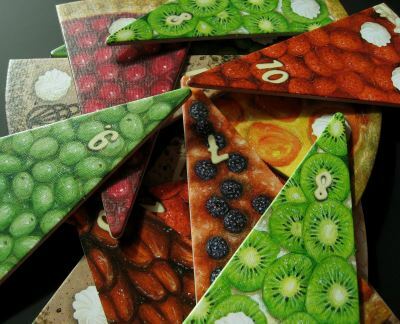 The number of points obtained is the same as the number of slices in the game and is written on each slice of that type of cake. For example, there are eleven pieces of chocolate cake in the game and the player with the most slices will win eleven points at the end. Crucially, in case of a tie, all tied players score the points. In general, players can only eat fresh cake (i.e. cake just served), the exception is that they can forfeit the opportunity to take fresh cake and instead eat all the stale cake of one type in front of them. This might be a good idea if a player can see that they cannot win a category and the number of blobs of cream will give them more points than they would get from the fresh cake. Burgundy started off as the Baker. Blue began modestly keeping a slice of apricot cake and eating her chocolate cake (having given up chocolate and cake for Lent, this was very appealing). Meanwhile, Cerise began collecting strawberry and chocolate, Grey went for gooseberry leaving Red and Burgundy to fight it our for cherry, blackberry and plum. In the second round, Burgundy set the tone by pinching the a slice of apricot cake from under Blue’s nose handing her a load of relatively worthless slices in the process. From then on, it was more about stopping other people from getting what they wanted than about collecting something useful, which meant that those who had picked up the start of a set in the first round were in the best position. The game ended with players sharing the top spot for a lot of the categories, but the strawberry and chocolate that Cerise had picked up early on gave her a massive number of unshared points. The title of Master Baker went to Burgundy, however, winning by a single point. By this time, Green, Black and Purple had arrived, so we split into two groups with the first starting off with the “Feature Game”, Niagara. This is one of the first games we played in the group back in October 2012, and it was certainly long overdue another outing. The idea of the game is that players are travelling up and down the Niagara River in canoes collecting gems. The river is the feature of this game as it is made up of plastic discs that actually move during the game carrying the players boats towards the falls. Each player has a set of “paddle cards” with numbers 1-6 and a cloud on them and each card must be played one can be reused. Simultaneously, all players choose a paddle card, then they take it in turns to resolve their card. Each player has two canoes which can either be on the bank or on the river. Any boat on the river must be moved and a boat on the bank can be moved if the player wants to (though if they are both on the bank, only one can be moved). Movement is exactly the number shown on the chosen paddle card, no more and no less (except when bring a boat home with a gem on board) and the boats cannot change direction during the turn. In addition to moving, players can also load or unload a canoe, which costs two movement points and must be done at the start or end of a move. An empty boat that is travelling up-stream and lands on a space occupied by another boat laden with a gem may also steal it for no charge. At the end of the round, after everyone has taken their turn moving their boats, then the river moves. It’s movement is dictated by the smallest canoe movement, modified by the weather. Each player has a weather paddle card and as one of their options, they can alter the weather setting from sunny (-1) to very rainy (+2). Thus if the lowest paddle card played was a three and the weather was very, very wet, the river would move five spaces. The winner is the player who has either four gems of the same colour, five of different colours or seven of any colour at the end of the game. The game started well, and “just to demonstrate to everyone how it was done”, Blue nicked one of Burgundy’s gems and then increased flow rate of the river. She got her comeuppance since she promptly ended up with two yellow gems. Meanwhile, Cerise had collected two clear gems and Red followed Blue’s example and increased the weather flow to it’s maximum. By the time everyone had been through their paddle cards once, everyone had moved on to trying to get the difficult pink and blue gems that are perilously close to the cataract. The inevitable happened then, when everyone played a “6” and one of Cerise’s precious canoes went sailing over the waterfall. Despite turning one of her boats into match-wood, she was still the first to get a complete set of five different coloured gems, giving her the win. Meanwhile, the other group were showing no signs of finishing, so since Cerise had never played it, the group moved on to one of Red’s favourite games, Bohnanza. Cerise was very generous which meant everyone else followed suit and the game wasn’t as tough as it has been when we’ve played it recently. Burgundy went for the “high value” market, but suffered and Red and Blue’s mixed bean strategy and Blue finished just two coins ahead of Red. The other group were still what seemed like hours from finishing, so the first group tried decided to move onto their third game. Burgundy expressed an interest in playing Blueprints, a cute little dice stacking game. However, just as Blue was getting it out, Black suddenly commented that their game was coming to an end. Blueprints can be a little lengthy, so it was quickly replaced with Tsuro, which turned out to be just the right length. Tsuro is a very simple tile laying, path making game, that has the advantages of playing a range of numbers reasonably well, as well as being very quick to play and extremely easy to teach. The idea is that players have a stone which is located on the board and a hand of three tiles. On their turn, they have to place one of the tiles on the board next to their stone such that it extends it’s path and remains on the board, then they replenish their hand. Players continue until their stone collides with another player’s stone or it is forced off the board (by another player or because they have no choice because of the tiles they have), in which case they are out. The game started slowly, but Red was the first to go, when she lost a tussle with Burgundy. Burgundy didn’t last much longer, leaving just Cerise and Blue to tough it out. Blue was forced to place a tile that left her at the mercy of Cerise, but Cerise had no choice and collided with Blue, ending the game. By this time, the other group were just adding up their scores, but what was it that they had been playing that took so long? Well, they had been playing Village with The Port expansion. In Village, each player takes the reins of a family striving for fame and glory. The game is full of difficult decisions, however, it feels like it moves quite quickly. What is particularly unique though, is the way the game uses the delicate subject of death as a natural and perpetual part of life in the village and a mechanism for dictating the flow and duration of the game. Each player starts the game with a personal farmyard board and the four members of the first generation of their family. There is also a central village game board which depicts the different locations players can go to carry out different actions. At the start of the game/round influence cubes are drawn at random from a bag and placed on these locations. During the round, players take it in turns choosing a location and taking one of the cubes and then (optionally) carrying out the action. There are a range of actions, from “building a family”, to “crafting goods” or “going to market”. Some of these (like visiting the “well”) give resources of some kind, while others (like going “travelling” or “entering the church”) are primarily a means to obtain points. While the action is optional, taking a cube is mandatory. If there isn’t a cube available at the location, then the action cannot be taken. Cubes are then used to pay for some of the actions. In addition to the cube cost, some actions also have a “time” cost: around the edge of the players farmyard, there is a time track and once a player’s token has been round the board one of their meeples dies. When one of their meeples dies, the player has to choose one of their oldest generation family members (i.e. those numbered “1”, or in the event that they are all deceased, one numbered “2”) kill them off. These meeples are then either laid to rest in the Village Chronicle or in one of the anonymous graves behind the church. Family members placed in the Chronicle will score victory points at the end of the game, however, if there is no room in the relevant section of the Chronicle, the family member is placed anonymously in the unmarked graves behind the church where they do not score. The game will end when either the last empty space in the Village Chronicle is filled, or the last anonymous grave is filled. The winner is the player with the most points at the end. It took a little while to set up and revise the rules and to work out how the new Port expansion fitted in. Basically this replaces the original travelling option with the ability to board ship and travel the seven seas. Players hire a captain, and then use the ship to sell domestic goods and pick up foreign commodities. Family members can be sent as missionaries to far away islands and dig up treasure chests. Eventually the game began. Black started out collecting green cubes, aiming for a market based strategy. Grey was attracted by the large number of points provided by the expansion and decided to pop down to the port and start sailing almost immediately. Meanwhile, Purple and Green were a little less certain of their initial direction and just built up a small stock of tiles (namely ox and plough to maximise wheat production). By the end of the first round, both Purple and Green had sent family members into the church bag, and, by pure chance, both Green’s came out. In the second round Purple joined yellow at sea, Green fumbled over getting his first meeple to work a second time in the craft halls without dying while Black (a hard task master) worked his first meeple into an early grave without shedding a tear! Blue was also heading deeper into the town hall, piling up extra bonus green cubes and tiles to enhance his market buying opportunities. Grey continued a balancing act at home while slowly filling his boat. Green joined Grey and Purple and took to the seas with the highest level captain and rapidly made his way round to collect the various goodies. Purple decided that she did not like the apparent slight by the God(s) and placed even more into the church, and paying for them to be taken out and so gaining the end of round church bonus. Everything was looking rosy for Black, producing quite a pile of market chips, until the sailors began to return, and were able to swap their bounty for lots of points, saoring into the lead on the victory point track. Black was still confident, if a little nervous now, especially since Green had managed to plant one of his meeples in the far corner of the sea for a huge haul of points at the end. The books of remembrance were slowly filling, as was the grave yard. Black then took a late plunge into the waters, while Green started sending family members to join the local council in the Town Hall. Purple collected cubes a plenty (enabling her to make some free actions of her own choice to her advantage) and Grey was really getting to grips with the game and was making good use of his second trip to sea and happily killing meeples left, right and centre, like mad despots! There was a close finish in the final round. Initially everyone thought it was going to be the last round, but then it started to look like the grave spaces would not be filled after all and another round would ensue. Then, out of the blue, Green used three cubes to visit the market place, which had otherwise been empty of action cubes. Buying twice killed off another meeple, which filled the last space in the graveyard and the game was suddenly over (leading the other group to change from Blueprints to Tsuro). With one last turn each, only Black was able to do anything to increase his score at this point. Before the final scoring it was very unclear who had won: Green and Grey were far in front on the victory point track, but Black had a lot of market chips. It turned out, Black had just done enough, pipping Green by a couple of points with Grey and Purple not far behind in what had been a very close and enjoyable game. Learning Outcome: Killing meeples is great fun, if a little time consuming! This entry was posted in Games Night and tagged …Aber Bitte Mit Sahne, Blueprints, Bohnanza, Niagara, Tsuro, Village, Village Port on March 6, 2015 by nannyGOAT.